People warned us about the summer heat in South Carolina. But we honestly didn’t mind it. My theory is this: you must embrace the fact that YOU WILL BE SWEATY. It’s not an “if”, but simply a certain fact of life here in the South. We learned this little trick from all the HOT art shows we’ve done over the years, and it served us well this past May through September. You are not TRULY HOT, until you find yourself unhindered by the fact that you are standing with your feet shoved inside your small cooler of ice as you are talking to potential customers. So during on one of the more toasty weeks in August, I spent a couple of days in the garage making my new MOSAIC type fireplace surround. Here is a close-up of the results. I love how the glass circles add some whimsy to my room. 1.) Find somebody who is amazing at measuring. 3.) Visit all stores you know that would carry glass beads–the kind you would use to put in the bottom of a vase. Places like Target, Michael’s, Hobby Lobby, The Dollar Tree (best deal for only $1/bag, but least cute bead selection) and buy as many as you can afford. 7 or 8 bags would probably be safe. I could not afford very many, so I just dug through my house and found some I had bought about 5 years ago. I’m glad I had these because I would have been short. 4.) Go to a place like Home Depot, and buy at least 2 quart containers of the grout/adhesive compound that is pre-mixed (the gallon is probably a better value, but at first I didn’t think I would need that much. So maybe just plan to buy the gallon to be safe.) Also be aware of what color you are choosing, as it comes in different shades. I chose white since my fireplace is stark white. 6.) Start on the left bottom side, and slide all the stones off the board and onto your table. Try to keep them in the same pattern that you had decided on. 8.) Just pretend like you are frosting a cake with the grout, and try to get it on about 1/4″ thick; nice and level. 9.) Start putting the glass beads into the grout. (This is the most fun part of the process so enjoy it while it lasts. The hard work is soon to come…) Be careful to keep the beads level, and make sure their placement looks pleasing to the eye. 11.) Now the gross part—grouting the beads. You will be sad once you start, because the grout will get on your clean shiny beads and make them cloudy, but I don’t know of any way around that. Just accept the fact that this won’t be as shiny as you had first imagined it would be when it’s all done. TO GROUT: You basically do the same thing as in steps 7-9 again, but this time covering the beads; working in those same 1 foot sections. 12.) As you grout, have a bucket of water and some rags near you. (This gets really messy, so that’s why I suggested doing this project in your garage.) After the grout has set for about 1/2 hour – 1 hour, you’ll want to go back to the sections that are grouted and try to wipe the grout off the glass beads. Unfortunately, this will be easier said than done. I actually went back and did the wiping off process a couple of different times until I was satisfied that no more grout could come off my glass. 13.) After about another day of drying, go back one last time and use your small putty knife to push any stray grout off the edges of your glass beads. Wow. That is a lot of steps. Now that I wrote it all out, it sounds like it was a total nightmare project. I actually didn’t mind doing it at the time. HOWEVER, I chose to work on this project the week my son was visiting his Nonna and Poppa in Indiana. I would not recommend attempting this project if small children will be around, not for their safety but simply for your own sanity. 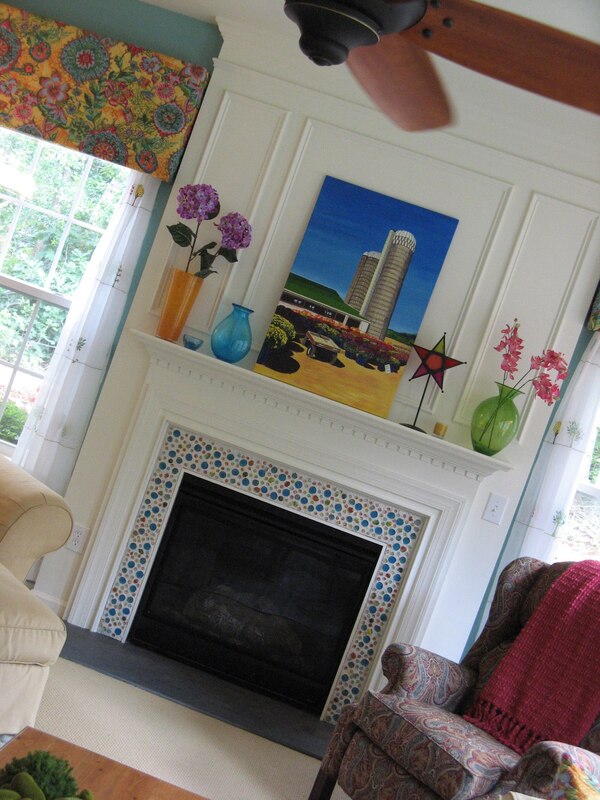 Our fireplace all decked out for summer. 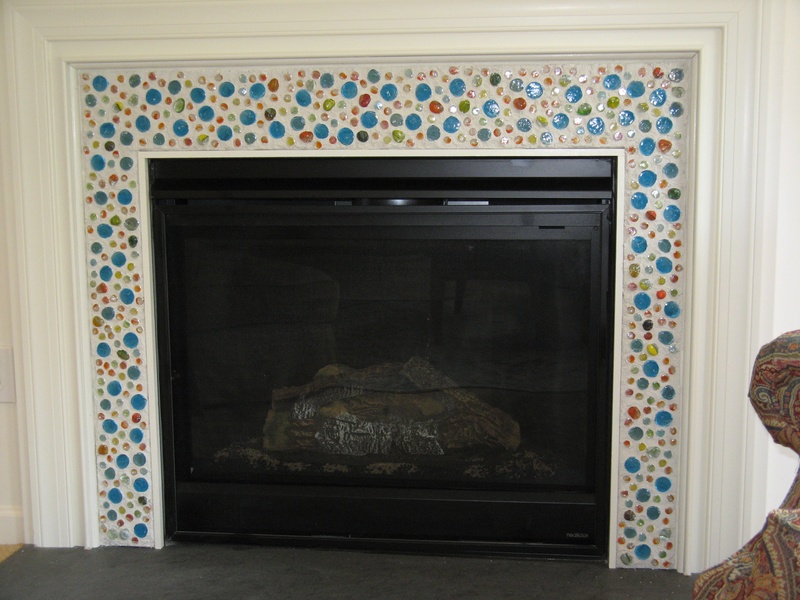 This entry was posted in summer in south carolina and tagged do it yourself project, fireplace surround, http://www.mariescottstudios.com, mosaic. Bookmark the permalink. ← What exactly is there to BLOG about? Ooo, thanks for the instructions! 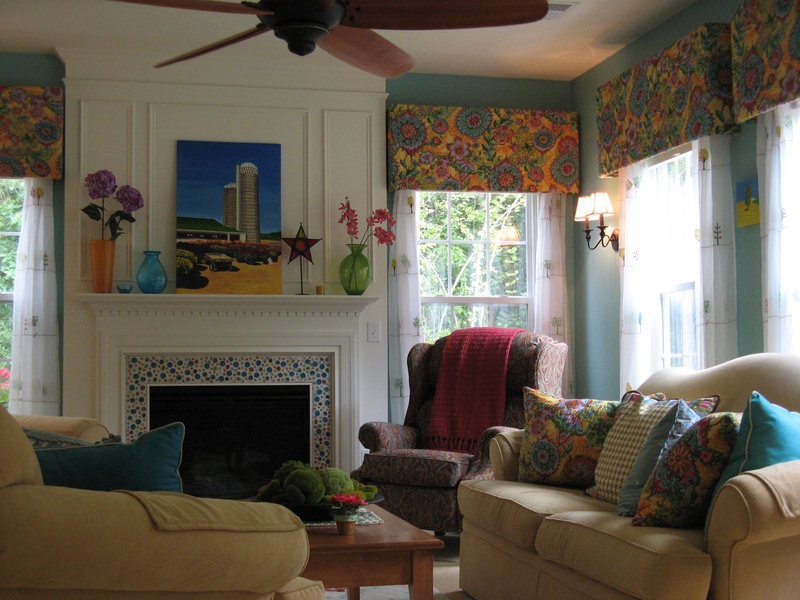 Maybe someday… I’ve hated our fireplace surround since we moved in to this house 5 years ago! I assumed that you somehow just did this project over your existing tile. Does the fact that it’s on a piece of plywood mean that you can someday remove it if you ever want or need to? Yes! We definitely wanted to be able to remove it in case we ever get tired of it or want to sell the house.